My trip through all the great albums of 1984 has led me to make many conclusions about the year, the music and certain bands. Here’s another one. It is my belief that Saxon were the best band from the new wave of British heavy metal, (NWOBHM), age not to have made a major impact in America. Sure, I had heard of them and even heard a couple of their songs back when I was in the marines stationed on Okinawa and liked them, but I never got around to listening to them properly until early 1985 when I heard their classic “Princess of the Night” from the outstanding “Denim and Leather” album on a metal compilation album. While I did make up for that mistake afterwards, I still think that Saxon never really got the recognition in America they truly deserved. I love the way “Crusader” opens. It starts with medieval fanfare with galloping horses and all before going into the big title track. For me, it’s history coming to life through music as the story of crusaders is told in the song. It also helps that that period of history is one of my favourite eras. You know, knights on horses hacking down their enemies with swords, damsels in distress and catapults reducing castles to rubble, I love all that. I do think that if teachers play this song while teaching about it in school, more metalheads would wake up and pay attention and learn about all about the Crusades. Tired cliche alert: One song doesn’t make or break an entire album. The rest of “Crusader” holds up very well and I do hear all the good things done on “Denim and Leather” on it. It’s just that one track, “Just Let Me Rock” seems to take all of those good things and incorporate them all into one song, although the title track of “Denim and Leather” seems to be the biggest influence here and that’s not a bad thing because Saxon definitely did not simply clone that song. On that thought, “Bad Boys Like to Rock and Roll” sounds like a fusion of the “Denim and Leather” tracks “Rough and Ready” and “Midnight Rider” and again, it’s done very uniquely and played outstandingly. The one song where there is no influence from my favourite Saxon album is the power ballad, “Do It All For You.” Power is the key word in the song and it does belt your eardrums even though it’s a ballad. However, the big clincher on the track is the Biff’s vocals. His best effort definitely shines through here. I usually view covers of songs with a hint of cynicism and I did so with the cover of The Sweet classic, “Set Me Free.” Another cliche alert: Saxon put their own stamp on it and make the song their own, believe me they do. It’s not often that I like a cover as much, possibly more than the original, but I can’t fault Saxon’s efforts here. The answer, I think to why I like this song and all the other songs so much, is the guitar work of Oliver and Quinn. Both guitarists are simply exemplary on the album. While I might have only highlighted a few songs on “Crusader,” let me just say that all the songs make this album great. For a young American living in the sticks of Southern New Jersey in 1983, Diamond Head was probably the best kept secret of the new wave of British heavy metal, (NWOBHM). I only was fortunate to know their existence because I happened to see them live in England that summer. However, if that is truly the case, then Saxon was the best NWOBHM band not to fully get the respect in the US they truly deserved. Their 1983 album “Power and the Glory” is a solid piece of evidence as to why. It would be a very difficult task for any Saxon album to knock off “Denim and Leather” as my favourite album of theirs, so “Power and the Glory” will have to settle for number two. It is every much the killer as its 1981 predecessor! I have to admit, I’m pretty much impressed with all eight of the tracks on here. Maybe that’s why it’s only number two because “Denim and Leather” has nine. “Power and the Glory” opens with the title track which is a good song to catch your attention. However, compared to the other tracks on the album, it’s the weakest, not that in any way it’s not a good track, it is. But the others that follow are mind blowing. Some really cool guitar solos from Oliver and Quinn on the tracks “Nightmare” and “This Town Rocks.” On the latter, I am wondering which town they are singing about because back in the mid 1980s, I lived in a town that didn’t. Some might say that about the town I live in now in the UK but those who rock aren’t visible. They just come out whenever a cool band like Hells Bells comes to town. Here I go digressing again. Great songs all here! Impressing me further is the intro to “Midas Touch.” While Saxon has historically had many songs whose introduction has been a great hook, the one on this track takes the top spot for the album. And like so many Saxon songs, “Midas Touch” isn’t a song with a great intro that descends into mediocrity as the song progresses. 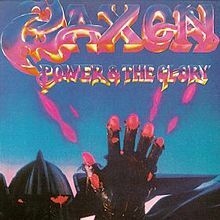 Some might argue that with all the great metal, especially (NWOBHM) albums that were out in 1983, it’s easy to see why Saxon’s “Power and the Glory” might have been overlooked in the US. 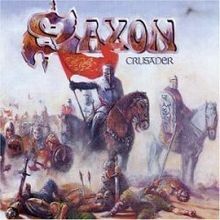 No excuse I say and I wish it didn’t take me another two years before I started listening to Saxon in earnest. This album deserves to stand with all the other ones that were around in that year. I know I’ve said this before, but Saxon didn’t fully come to my attention until 1985. I had heard of them before that and even remember liking one of their songs but I can never remember which one. I blame it on the booze. Their master song “Princess of the Night” appears on a compilation album I had bought in the above year but it would be more than another year until I saw this great album “Denim and Leather” on sale at my local record store for $3. I snapped it up without further thought and it is probably the wisest investment I ever made. “Denim and Leather” is my all time favourite Saxon album and it is easy to understand why. But before I sing it’s praises, let me begin with the one minor flaw with the album, if you want to call it that. It is with the song “Rough and Ready,” which is about being a hard man. Now, in my mind, there is nothing more ridiculous than someone who is clearly not hard trying to sound like they are and sorry Biff, you’re not convincing here. Saying that, the song does redeem itself with some good musicianship equal to the rest of the album. That leads nicely to the monster classics on this album, there are no fewer than five blockbusting songs on “Denim and Leather.” Of course, I have to mention the track already mentioned “Princess of the Night.” It has such a killer intro that stays with you long after the song is done. Even now, I listen to it and say “wow!” Not taking anything away from the three songs that follow “Princess of the Night,” especially “Never Surrender,” but “Play It Loud” is definitely the “Wheels of Steel” of the album in the sense that it is the perfect song to play at full volume when driving in your car. I bought the album on cassette so I got to do a lot of that back in the day. Just when you’ve gotten over it, your ear drums are once again assaulted by another great one in the form of “And the Band Played On.” The guitar work in this song is completely amazing, my head just wants to keep banging away to it even when it’s over. “Midnight Rider” follows on and between this song and “Princess of the Night,” I get the impression that Saxon are into trains because that’s two songs about them. That doesn’t stop the former from also being a killer song. Then following “Fire in the Sky,” which like April Wine’s “Caught in the Crossfire” is about nuclear destruction, a relevant fear back in 1981 with Ronald Regan wanting to put cruise missiles everywhere, is one of the finest album closers of all time. The title track “Denim and Leather” is the best way to bring any album to a close. Like the other gems on the album, it has that memorable guitar crunch that aids Biff Byford’s vocals in creating history. 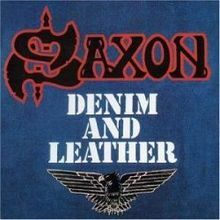 For me, Saxon’s “Denim and Leather” is definitely my pick for one of the best albums of 1981. When people mention NWOBHM, they are quick to say Judas Priest, Iron Maiden and Def Leppard, but Saxon only gets mentioned as an after thought in many cases. I think the problem was that they put out their three greatest albums in rapid succession, sort of like Blackfoot. Furthermore, Oliver and Quinn often get left out when great guitar duos are mentioned. They are every bit as good a combo as Downing/Tipton and Smith/Murray. It is a shame that they didn’t make it as big as the the others but they’re every bit as good. “Denim and Leather” is proof in the pudding.